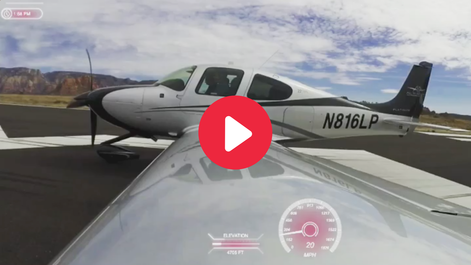 Video of All In Aviation conducting a “Destination Training” flight lesson over Sedona, Ariz.
Las Vegas, Nev. – All In Aviation, a full-service aviation company specializing in Cirrus Aircraft flight training, aircraft rental and sales, invites Las Vegans to Beat the Heat this summer with new “Fly + Lunch” flight lesson packages to Santa Monica, California; Big Bear Lake, California, or Flagstaff, Arizona. Recognized throughout the national aviation community as a top flight school, All In Aviation specializes in “Destination Training,” where student pilots from across the U.S. learn to fly in the most sophisticated aircraft on the market over scenic locations like the Grand Canyon, Lake Mead, Red Rock, Zion and Sedona. The perfect high-end adventure, All In Aviation’s summer packages include the following highlights. Final price depends on total hours, aircraft model and activities. (Lessons require a two-hour instructor minimum, instructor is paid hourly and aircraft is billed for time of use). Reservations and purchases can be made by calling 702-ALL-IN22 (702-255-4622) or visiting https://www.allinaviation.com/. 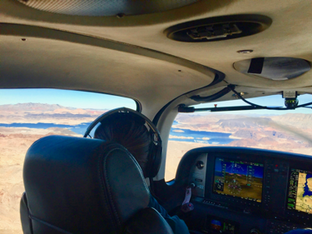 A student pilot conducts a “Destination Training” flight lesson with All In Aviation over Lake Mead.